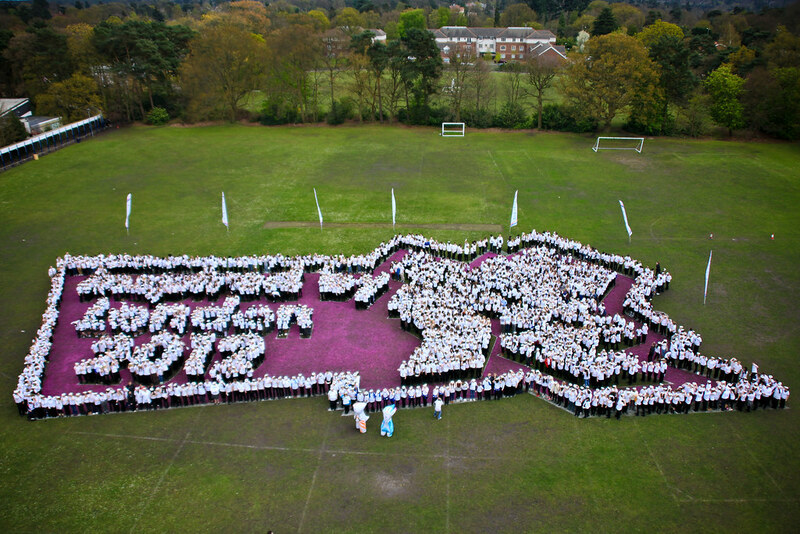 A group of 2,012 school children created a giant human London 2,012 logo to celebrate Surrey County Council’s P&G Surrey School Games today (24 April 2012) at Collingwood College in Camberley, Surrey. Click here to download photo. A giant human London Olympic logo was created by 2,012 school children today (24 April). The spectacle covered a whopping 1,800 square metres at Collingwood College in Camberley, Surrey. Surrey County Council organised the event to celebrate the P&G Surrey School Games which encourages kids to take part in sport. The youngsters were joined by Olympic rower Debbie Flood, GB Olympic trampoline hopeful Amanda Parker, LOCOG deputy chairman Sir Keith Mills and 1948 Surrey Olympic torchbearer Austin Playfoot. Helyn Clack, Surrey County Council’s Cabinet Member for Community Services and the 2012 Games, said: “Thousands of children created a slice of Olympic history right here in Surrey. The children were beaming with excitement as they took to the sports field to create the giant London 2012 logo. Spectators also enjoyed a demonstration from Camberley Judo Club, a gymnastics spectacular by Collingwood College students and a display of 50 flags created by children from Surrey and across the world. The 2012 P&G Surrey School Games was organised by Surrey County Council to get more young people involved in sport. It has already seen more than 3,000 children take part in dozens of county-wide sport and art competitions. Last year, 1,900 people, mostly children, broke the world record for the largest human Olympic rings. Surrey is hosting the men’s and women’s Olympic cycling road race events on the opening weekend of the Games (28 and 29 July) and the Olympic road cycling time trials on 1 August.